A great way to save money is by checking out if your market has a "reduced for quick sale" rack or section for meats or produce. Joseph's Marketplace has a cart near the yogurt section that they bring out daily. The old ladies watch for it like hawks. I have learned to swoop in quickly when I see them gathering. They know the cheap produce is near! I just took this photo at the store today. The old ladies were like VULTURES around the rack. I grabbed some territory and went to town. 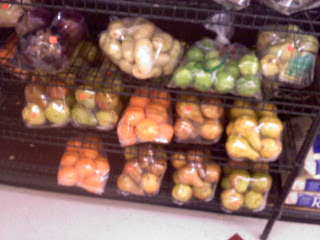 I got a sack of perfectly fine potatoes & a big package of onions for $1 each!!! I got SIX red onions the other day for $1. Yes, a couple had some funky spots, but I cut them off & they are just fine. You can get tons of nearly free slightly bruised apples for $1...great for pies or applesauce. I got 6 ginormous sweet red peppers a couple weeks ago for $1 also. They may have a little wrinkly flesh, but that won't matter for what we are doing with them. Crank your broiler in your oven and put the rack near the top. Put the peppers right on the rack. Have some long tongs ready. Keep an eye on them. When the skin is ALL BLACK on one side, rotate it and keep doing so until the whole pepper is black. The kitchen will smell guuuuuuud. 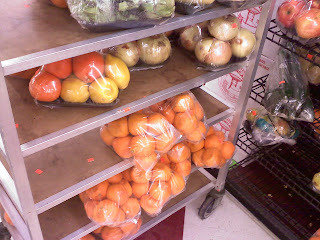 When they are all soft & black, remove each one & put it in a paper lunch bag and roll up the top. Leave them there until they are just warm and easy to handle. The steam releases the skin & they can easily be peeled. Clean 'em up & put them in an old pickle jar in pieces. I like to add a clove of garlic too. 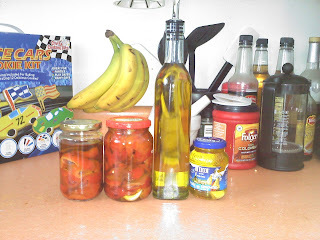 Once the jar is full, cover them with olive oil (you may have to push them around a bit to make sure the oil goes all the way to the bottom) and put them in the fridge. Voila! Awesome roasted red peppers for $1 and about 30 minutes of your time.